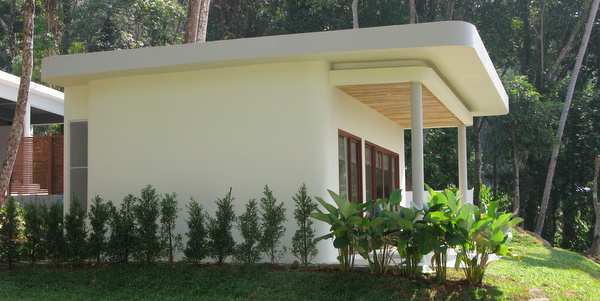 Nest Sense is one of Koh Chang’s newest luxury boutique resorts. Located at the southern end of the very popular Lonely Beach, Nest Sense Resort has 18 villas in simply landscaped gardens by the sea, together with a swimming pool, terrace and restaurant. Accommodation comes in three styles. Individual deluxe seaview rooms occupy either the top or bottom floor of 4 compact, two-storey buildings. Individual seaview villas, laid out in two nicely spaced rows, overlook the ocean. The pool villas are on the hillside just above. Nest Sense Resort has one small but charming infinity pool, with a few loungers on the terrace alongside. Nest Sense Resort sits on the rocks above the sea at the far end of Lonely Beach village. It’s at least ten minutes walk to the sand and beach itself. You would not normally swim from the area in front of the resort due to the rocks underwater. That said, the braver among us might snorkel. The standard amenities in Nest Sense Resort rooms include individually controlled air-conditioning, 32″ TVs, cable TV access, safes, and daily house-keeping. The villas come with rain showers, the pool villas with fridges too. Looking out over the pool and ocean beyond, The Treetip Restaurant at Nest Sense Resort serves food all day from its à la carte menu. It does not go in for buffet breakfasts, rather you order as you go. Dishes include all the usual Thai favourites, good appetisers and some western choices. Cocktails are also available alongside a decent wine selection. The food and drink gets very good reviews, with stylish presentation, balanced spicing and a terrific location, especially at sunset. It’s also easy enough to venture up to the street and into Lonely Beach village, where you will find a whole array of cheap restaurants, the odd coffee shop and plenty of bars. Parties occur somewhere most nights. The staff and service at this small resort offer a great personal touch, friendly, professional and keen to please. The resort, the villas and rooms are designed in a wonderfully simple manner – white washed walls, gentle curved corners to soften the building lines, clever use of wood features and lots of natural light from double fronting glass doors. Each room has a good sense of private space from their terraces and of course, excellent sea views. The pool and restaurant continue this theme of minimalism to great effect. Despite being at the end of Koh Chang’s party beach, the atmosphere is one of calm seclusion, nearer enough to the action to dip in as you please, but also far enough away to give it a miss. Nest Sense Resort will appeal to couples mainly, maybe those seeking some luxury at the end of a trip, maybe those who like to party but need their comforts. Equally, it would also suit holidaymakers looking for a very good 3 to 4 star small resort, intimate, friendly, well run and very laid back. Child under 6 stay for free if using existing bedding, cots not available; over 6s considered adults. Lonely Beach is Koh Chang’s backpacker, traveller and party center. It is in two distinct areas, with the excellent small beach some 5 minutes walk from the village itself. There are just a handful of resorts on the sand, but a wide choice of accommodation back in the village. Here, you will also find bars and restaurants, the odd coffee shop, tattoo parlours, massage and ticket agents. Think Khao San Road by the sea on a much smaller scale and you are not far off it. Parties takes place most nights of the week during the main season and yes, noise can be a problem at night. Lonely Beach is a fun place to hang out, meet other travellers, let your hair down and enjoy life.